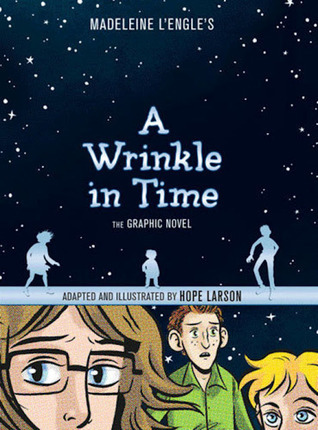 A Wrinkle in Time (the graphic novel) adapted and illustrated by Hope Larson from the novel by Madeleine L’Engle. Margaret Ferguson Books, 2012. Currently Available. Face Value: Graphic novels have an obvious advantage when it comes to cover art. It would be really weird not to use the artwork from the creator. And so, since the art in this book is good, we get an absolutely beautiful cover. I love the way we see our three heroes faces and silhouettes, the cosmos in the background, and the overall feeling of something bigger than ourselves that the images convey. There’s literally only one downside, and it’s featured on the back cover. Seriously – you couldn’t find a better choice to blurb your book than James Patterson? * L’Engle – and Larson – deserve better. Does it Break the Slate? Because this is an adaptation, I want to talk about the Slatebreaking on two different levels. First, Madeleine L’Engle wrote one of the quintessential Slatebreaking characters of all time when she gave us Meg Murray. Angry and impulsive and brilliant and loving, Meg has been shattering slates across dimensions of time and space for 50 years. And in this beautiful graphic adaptation, Hope Larson gives visuals to this character and her story in a way that captures every agonizing emotional moment and every stunning instance of bravery with remarkable subtlety. Who would we give it to? 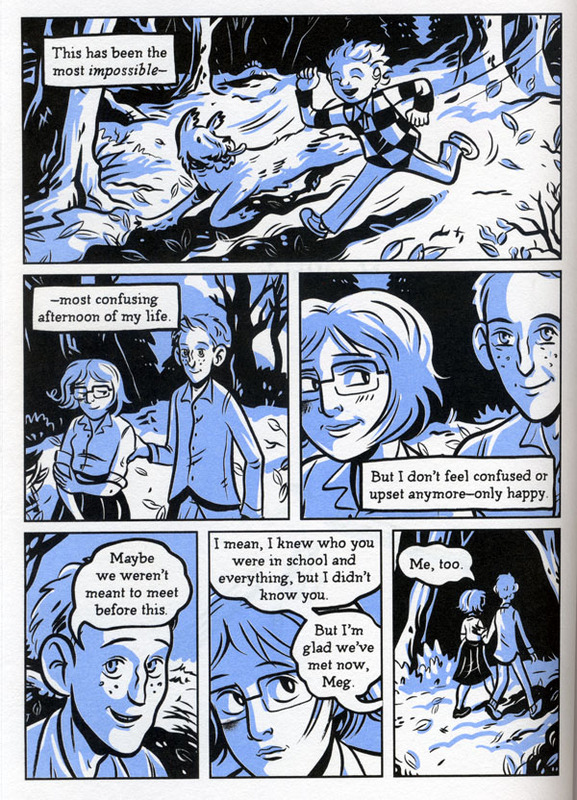 I think of this graphic novel adaptation much in the same way that I think about the stage production of A Wrinkle in Time that the theatre company I work for is putting up onstage this spring. I love the book, and nothing is ever going to replace the experience I had of reading that novel as a ten year old. However, I think that great art inspires other art, and I love adaptations of books that I love. I’m recommending that everyone I know who loved Wrinkle go see the stage play at Childsplay in a couple of months and I feel the same way about this graphic novel version. Read it to be reminded how much you love the original, and to be inspired by another artist’s terrific work. *True fact. I recently de-friended someone on Goodreads (someone I know in real life!) because they gave five stars to a James Patterson novel. Review: Most of us know this story. It won the Newbery in 1963, and was the start to Madeleine L’Engle’s incredibly prolific career writing children’s books. But if you don’t, here goes: Meg Murray is angry. Her father has been missing for a long time, and even though her mother insists he’s coming back and she believes it with every fiber of her being, she misses him. She’s brilliant, but struggling in school because she doesn’t learn the same way as everyone else (and has something of an attitude with her teachers and administrators). Her beloved younger brother Charles Wallace is so smart that most people think he’s stupid. And her mother seems like the epitome of brilliance and beauty in a way that Meg doesn’t think she’ll ever achieve. Everything changes on a dark and stormy night, when a series of events lead Meg, Charles Wallace and new friend Calvin O’Keefe on an adventure across time and space to rescue Mr. Murray and save the world as we know it. It’s a beautiful book, about the lengths we will go to save the people we love, about accepting yourself for who you are, faults and all, about science and philosophy and love. It’s a classic. If you haven’t read the original novel, you should. But if you love this story, or if you’re seeking a more visually oriented entrance point to L’Engle’s work, you absolutely need to take a look at this book. Every character is captured beautifully, and the emotional resonance of small moments is told in impeccable detail. But it’s once our heroes leave earth that the Slatebreaking really begins. Meg has to face her worst fears and her biggest faults. And these faults – her emotions, her impulsiveness, her anger – turn out to be the things that make her the hero in the end. Her human-ness make her a hero. She doesn’t become someone different because of her adventure, instead her adventure brings to light what she was capable of all along. I’m not assuming that things would suddenly become easy for Meg after this book (the sequels, even, prove otherwise), but now she has the strength in herself to face things differently. I’ve always loved this story and always loved this ending. I’m grateful to Hope Larson for giving us this beautiful perspective on it. Reviewed from copy purchased at Changing Hands Bookstore in Tempe, AZ. This entry was posted in Middle Grade, Reviews and tagged Graphic Novel, love, Madeleine L'Engle, Meg Murray, philosophy, Science, Science Fiction, Tesseract. Bookmark the permalink. Or, maybe Larson will tackle those titles in her own sequels. Thank you for sharing this! I adored this novel as a child- It’s definitely one of the most powerful children’s pieces that I’ve ever read. I look forward to this graphic novel! 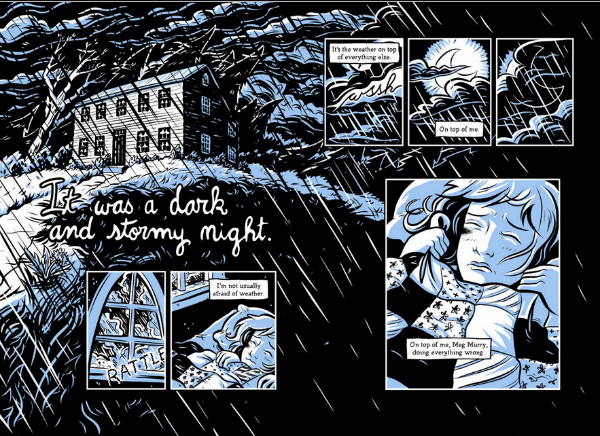 Me too – and I found the graphic novel to do it a real service as it’s own piece of art. I’d love to hear what you think!